Absolutely gorgeous day. Spent the morning at work (not so gorgeous), followed by a walk down Saskatchewan Drive into Mill Creek Ravine. Almost too hot, but a nice breeze kept me from swooning (but not sweating.) The trees north of 98th Ave have been devastated by the LEAF ROLLER CATERPILLARS. An entire canopy of leaves sucked dry of colour and life. It’s so weird because these trees (mostly ash) are surrounded by trees (mostly poplars) that are completely unaffected by the worms. The be-wormed trees look dead, although they do come back to life by August. On ONE branch alone I counted 24 worms hanging from the leaves in tangled strings of varying lengths. Very ugly. Saw a guy trying to console his son near Henrietta Muir Park after what I can only imagine was a nasty encounter with the caterpillars. Bikers have it the worst. I only walk in this corridor between the Muttart and Louise McKinney because the affected trees are easy to avoid…if you know where they are. 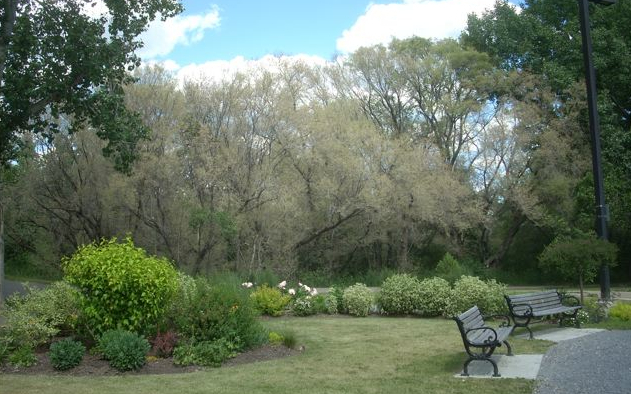 Other parts of the river valley, particularly Rossdale, are out of bounds until mid-July. I know a lot of people loved the dry, mild winter that we had, but all I could think about…other than the black ice everywhere, was the leaf-roller caterpillar eggs NOT dying in the balmy temperatures. I’d take a couple of weeks of -30 weather to have a spring and summer without the green menace. But…the other side of the bridge, in Louise McKinney, the view was bucolic. Green and lush and so, so, summery. Popped up to downtown for a Very Berry Booster Juice and a ride home on the train. Today, Canada Day, it’s raining, but the sky is lightening up. Maybe a walk in the afternoon. Addendum: 45 minute jaunt in Whitemud Creek with the dog. Humid, but sunny. Hmmm. We got Juned on the first day of July.